chole recipes. kabuli chana recipes collection. White chickpeas also popularly known as Kabuli Chana are legumes with high protein content. It is a small, beige-colored bean that looks like a wrinkled hazelnut. They are widely used in Indian and Middle eastern cuisine. They have a nutty and creamy flavour, which makes them versatile. From salads to curries, they are very easy to cook and one of the best ingredients you can keep in your kitchen shelf. Apart from being rich in proteins, they have numerous other health benefits. They are high in fiber, rich in Folate, Vitamin B9, magnesium, and also, they are good for diabetics and help in weight loss. Chole, an authentic dish from North India is a popular breakfast all over Punjab and Delhi. It can be eaten with piping hot bhature or kulchas. Infact, Chole is also the main ingredient of various chaat recipes like Chole Tikki Chaat, Chole Samosa Chaat. You can replace the regular potato tikki with a paneer tikki or Potato and Methi Tikki to make flavorful Paneer Tikki Aur Chole, Potato and Methi Tikki with Chole. These chaats are generously smeared with whisked curds, peppy chutneys, tongue-tickling masalas and finally garnished with sev, coriander or pomegranate seeds. The most important component to make the perfect Chole is the masala. You can add readymade chole masala or a home-made Chole Masala Powder. Using this, you can make various chole dishes like the pindi chole, peshawari chole etc. You can even add boiled kabuli chana to make various rice-preparations like the Kabuli Chana Biryani, Kabuli Chana Kofta Biryani or the Achari Chana Pulao. Boiled chickpeas are a great addition to salads. They make them filling and adds a bite to it. The Mixed Sprouts Beetroot with a sweet, tangy and spicy dressing is rich in Vitamins and a nutritious & tasty salad for weight watchers. You can even combine whole grains like quinoa with kabuli chana to make a healthy Quinoa, Rocket Leaves and Chickpea Veg Salad. Craving chaat while dieting? The Chick Pea Salad with Minty Curd Dressing is a tongue-tickling , tangy salad that will satisfy your cravings. Bored of eating salads all the time? You can quickly stir-fry Chick Pea, Broccoli and Carrot with oriental ingredients. The famous mezze platter consists of various chips and dips, pickled veggies and other Mediterranean delights like falafel, pita bread, lavash. Hummus is an authentic Lebanese dip made by combining chickpeas with tahini, curd, garlic, lemon juice and olive oil. You can even enhance the taste of this traditional dip with the addition/ substitution of ingredients to make assorted hummus like Spinach Hummus, Thecha Hummus, Garlicky Hummus. Using these various hummus, you can even make lip-smacking, quick sandwiches like the Toasted Hummus Sandwich with Vegetables and Lebanese Toasted Sandwich with Spicy Garlic Hummus. Falafel are deep-fried, kabuli chana fritters. They can be eaten as appetizers or you can even stuff them inside pita pockets with a curd dressing to make healthy, sumptuous snacks like Falafel in Whole Wheat Pita Pockets. 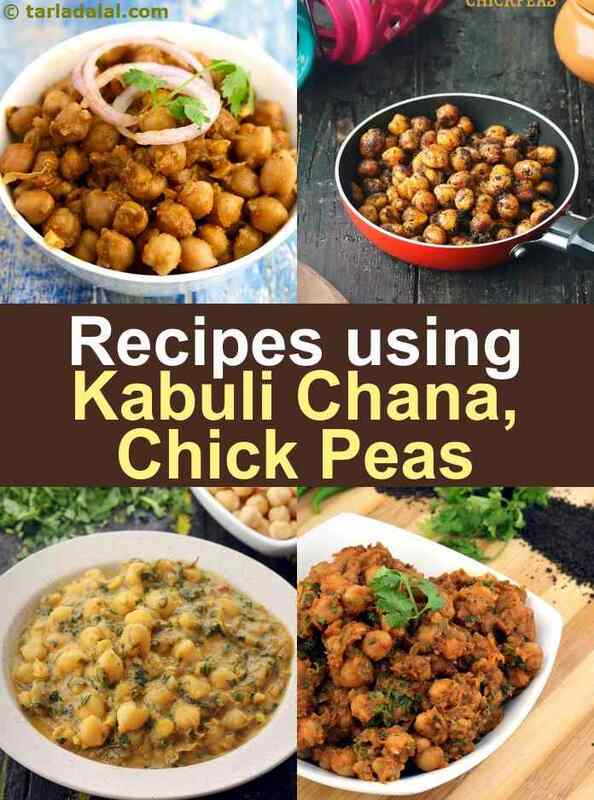 Enjoy our kabuli chana recipes | Chickpeas | Chole Recipes collection below. This recipe makes a filling and balanced snack in itself. Chapatti provides energy giving carbohydrates; soya rolls are rich sources of protein and calcium whereas vegetables provide vitamins and fibre. Thanks for this lovely collection of Kabuli Chana recipes. Chole is a fab recipe and our family favourite.